I realize I just came back from a week long vacation in Georgia but today’s post is not about my trip. Yeah, it was cool to get out town and get away from my scheduled world but this isn’t about me. This post is to help out my blogger friend Larry at Me, Myself and Kids plan his summer vacation. You may remember Larry from the guest post he did for my blog about his boys (if you missed it, you can read it here). Larry has asked myself and our other blogger friend Kate from Did That Just Happen to give him some ideas for his family’s summer trip. Before you read my part, take a look at Larry’s vacation question post and then click on Kate’s suggestions … which will lead you back here. Are you back now and caught up on the other posts? Then join us for the final leg of Larry’s trip … AND welcome to Orlando! Most people think about Orlando as the House for the Mouse but I’ve got a better idea for Larry to take his family. Right now, it’s smack in the middle of summer and when you go to the theme parks, it feels like the entire world has decended upon our city. And it’s hot right now in our part of the country. Like 90 degrees in the shade kind of hot. Disney is way too crowded and way too hot to spend the day waiting in line for 90 minutes for a 10 minute ride. 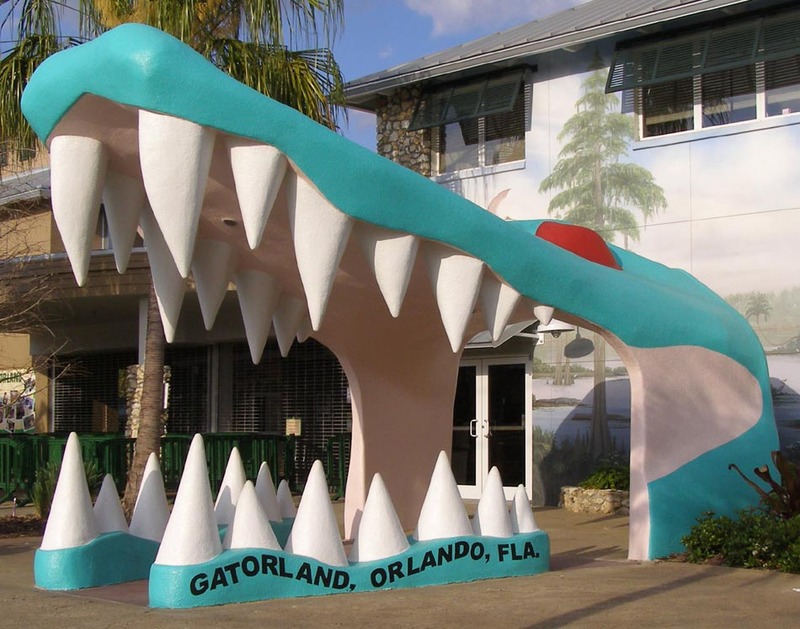 Larry … let me introduce you to Gatorland, our oldest theme park in Orlando. It was opened in 1949 as a roadside attraction and over the years, Gatorland has grown into 110 acres of gators, crocodiles, a petting zoo, splash park (to keep the boys cool), reptile shows and yeah, more gators. Don’t tell me your kids wouldn’t love to spend the day looking at the world’s largest collection of giant white gators and the up-close encounter shows. And if your boys act act up, tell them that you’ll put them on the zipline where they can fly over 500 feet of gators and crocs. That one usually works to get my son to behave. Hope you enjoy Orlando on your trip through the South! And don’t forget to swing by my house … remember you promised me that you’d dog sit for my dog Winston while I took a long weekend at the beach? Wow, Penney, who knew there was something else other than Disney in Orlando? A local is the answer to that question. But, those teeth look a little scary. In terms of dog-sitting, well that could be part of our vacation. Make sure to leave a stocked fridge! Nothing better than having a local show you around! That’s a photo from the entrance and everyone takes a picture there on the way out. Feel free to send me your list for the fridge and we’ll set you up! I was thinking how the picture would look of my kids being eaten by the gator. In terms of the list, think chocolate. Huh – I never commented on this post! LOL – I guess cause we emailed about it I didn’t feel the need! too funny. I have been thinking about your suggestion to do another Yelling Less update. Look for that post and I’ll be mentioning your name as the person who got me thinking about this.